Do ever find yourself craving a bucket of greens? While I eat salad (or other vegetables) just about every single day, there are some days when I just really crave a big pile of beautifully dressed greens. Yesterday was such a day, and so I decided to make us a huge kale salad for dinner. I started off with kale that I chopped and then massaged with a bit of olive oil to make it tender, then I started adding goodies. Hazelnuts that I toasted quickly on the stove. Big fat medjool dates chopped into small bites. A shower of grated pecorino cheese. And some fresh lemon zest for a bit of extra zip. For the dressing, I combine fresh lemon juice and olive oil with sweet orange blossom honey and a good pinch of ground cayenne. I added the dressing to the kale and gave it another good massage--then we sat down to enjoy our big salads (and the return of The Mindy Project-yay!!) with a side of thin, pan-seared chicken breasts and asparagus. Lots of green. Lots of good. 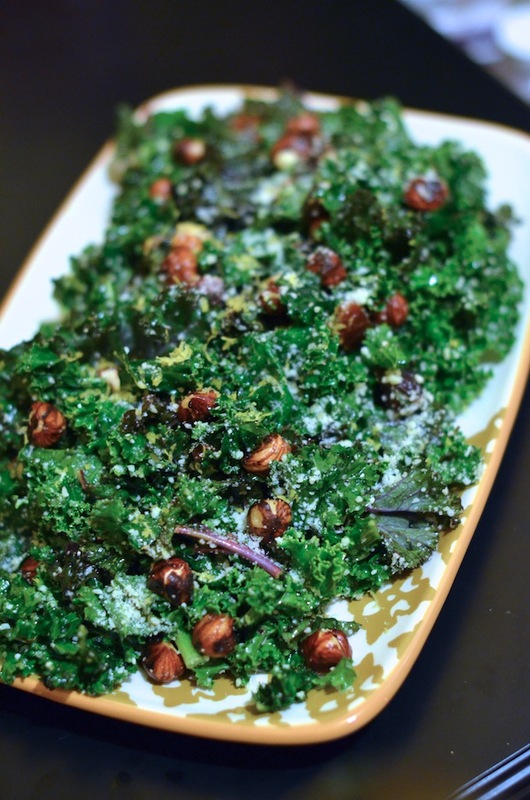 Place the kale in a large bowl and drizzle with a bit of olive oil and a pinch of kosher salt. Use your hands to massage into the greens, allowing them to soften a bit. Set aside. Heat a medium skillet over medium-high heat, and add about a teaspoon of oil and the hazelnuts. Sprinkle with kosher salt. Shake the pan to coat the nuts and let toast for about 2-3 minutes or until the nuts are toasted and fragrant, giving the pan an occasional shake. Remove from heat and let cool. Make the dressing: Combine the 1/4 cup of oil, lemon juice, honey, and cayenne, and whisk together until smooth. 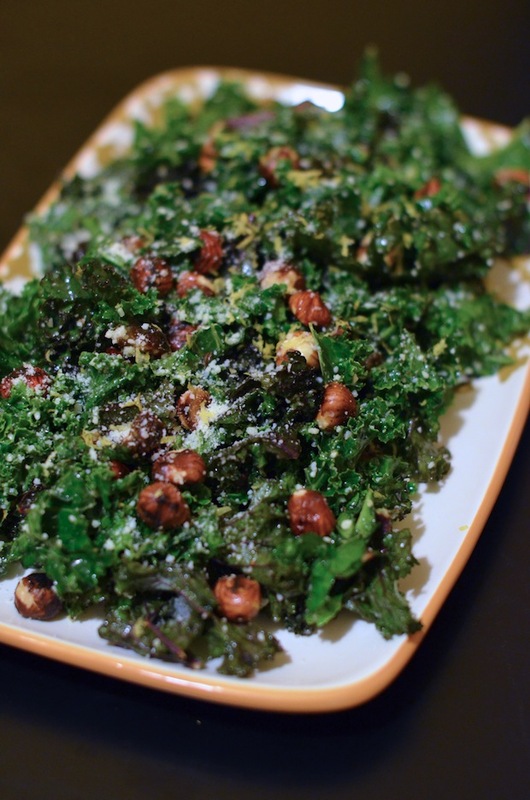 Pour over the kale, and add the cooled hazelnuts, chopped dates, and pecorino cheese. Toss to coat well. Season with salt and black pepper, to taste. Serve topped with the fresh lemon zest.